In 1898, McKim, Mead and White, the largest and most important architectural firm in the US at the time, designed the first building in Harvard University’s Radcliffe Yard, a gymnasium with a marble-lined swimming pool and an indoor track on the second floor. In 2006, Bruner/Cott transformed this much-loved but under-utilized facility into a vibrant, iconic resource for the Radcliffe Institute for Advanced Study. The building is now the symbolic and physical headquarters for the Institute and houses a large multi-purpose colloquia, lecture, performance and gathering space, administrative offices, meeting rooms and archival storage for manuscripts and research material. Bruner/Cott seamlessly integrated solutions to the inclusive usability of the building while preserving the historic fabric. The renovated space is also wired for the 21st century, designed to meet Leadership in Energy and Environmental Design (LEED) guidelines and energy-efficient. The original 1898 Radcliffe Gymnasium served its function for many generations of Radcliff students. 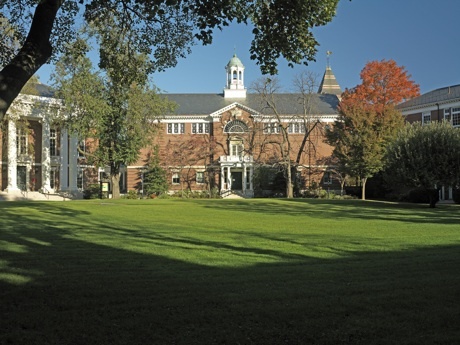 After Radcliff College and Harvard University merged, the purpose of the building eventually shifted to serve as rehearsal space for Harvard’s Dance Program. Some modifications, including the filling of the pool and the addition office space, had been made over the decades; however, Mckim Mead & White’s design had been largely unchanged. As part of a designated historic district, modifications to the exterior had to be reviewed and approved by the Cambridge Historic Commission. The new renovation was part of a larger effort of the Radcliffe Institute for Advanced Study to centralize activity in Radcliffe Yard. Architecturally, the gymnasium had great potential to serve as the Institute’s new home for their lecture series, fellows’ presentations, and cultural events. It also had the spatial capacity to house Institute offices and meeting rooms, and, in the basement, a climate-controlled archive vault. In order to provide accessibility to all levels of the building, space for an elevator was carefully inserted into the building, including the former gymnasium space and track level. The mezzanine track was reconfigured so that the entrance from the elevator was visually in keeping with other entrances. A new outdoor terrace and integrated accessible ramp were constructed on the west side of the building along a colonnade. Clearances at the front porch would not permit a compliant ramp without major alterations of the historic granite marble exterior porch. With support of the Cambridge Historic Commission, a Massachusetts Architectural Access Board (MAAB) variance was granted for this approach. This colonnade and ramp also provide access to the Agassiz Theatre from Radcliffe yard. The building is one of eleven Radcliffe Institute buildings in Cambridge, Massachusetts, eight of which surround Radcliffe Yard. This color image is taken from the open plan second floor with a view to the expanse of the open ceiling and chairs set for a lecture aligned on large, low-pile rugs. Color image shows the upper balcony, once a running track, on the upper level and open to the main floor below and the ceiling high above with sun-filled windows along the side walls. Sepia-toned drawing showing the entire front facade of the Gymnasium in section. Sepia-toned drawing depicts the floor plan of the second floor or track floor open to the main floor below. Sepia-toned floor plan for second floor multi-purpose room showing four different seating configurations organized on rugs atop a wood floor. Sepia-toned floor plan for the first floor depicts three conference rooms, offices, entries and interior navigation. Sepia-toned floor plan for the bottom floor depicts storage and archival area and interior navigation. Users were engaged in the design process from the very beginning in the form of a Steering Committee. The committee included the Executive Dean of the Institute, the Facilities Director, the Director of the Fellowship Program, the Director of Educational Programs, and the Dean of the Institute. Bruner/Cott consulted with a committee formed from the Radcliffe Institute, the local representative of the Massachusetts Architectural Access Board (MAAB) and Harvard’s Disability Compliance Office and followed standards set by the Americans with Disabilities Act (ADA), as well as Harvard University Design Guidelines. Compliance with the Cambridge Historic Commission was also necessary. While retaining the intricate language of the historic interior, this renovation created a dramatic social space for the Radcliffe Institute within the old gymnasium and track space. The second-floor of the gymnasium - used for everyday, informal gatherings and conversation - can be quickly and easily converted into a formal setting for lectures, panel discussions, films, and social functions. The track level defines a more intimate lounge space, as well as a “walking and talking track” for intellectual discussion and exchange of ideas. The first floor was reorganized to include administrative offices and conference and seminar rooms clustered by the Gymnasium’s front door on the Radcliffe Yard. On the lower level, the swimming pool was converted into a climate-controlled, archival-quality storage facility for some 8400 linear feet of the Institute’s historic documents and materials. he Radcliff Yard is part of the dense and very walkable and human-scaled urban environment. It is a short distance from the Harvard Square public transit stop. Bicycle riders may use the racks included on site. Those arriving by vehicle must find their own parking. Around the central lawn of Radcliffe Yard there is a paved pathway connecting the historic brick buildings to the surrounding campus. The main entry was not made accessible during the renovation in order to avoid fundamental alterations of the building’s historic granite and marble exterior porch. Rather, with support from the Cambridge Historic Commission and the Massachusetts Architectural Access Board (MAAB), the team designed a new terrace with an integrated accessible ramp on the west side of the building. The first level of the building contains office space and conference rooms for smaller and larger groups. Both the main and accessible entrances are separated from the main hallways of this floor via the entry vestibule. Those using the accessible entrance may take an immediate turn towards the building’s elevator and staircase. Covered in cherry wood paneling, the elevator reaches each level without impacting the building’s historic detail. The staircase entry is parallel with the elevator door, allowing users to arrive at the same point in the building on each floor regardless of whether using the stairs or taking the elevator. Another stair is located on the opposite side of the building behind the offices and it connect the basement, first and second floor. The basement contains mostly storage, including the archival vault in what used to be the gymnasium pool. The vault, bathrooms, and three other storage spaces are accessible; however other, smaller storage spaces on this floor are accessed by steps due to a differing floor height. What was the main gymnasium floor in the original building is now the second level “multi-purpose room,” a large, highly flexible space able to hold a diverse range of events and activity. Each seating area is arranged on a low pile rug, allowing all users to navigate the space comfortably and safely. The rugs and seating perform an additional role in sound absorption; without them, the room would be especially prone to echoing. The third level mezzanine track hangs above this space and can be accessed by elevator or stair. Additional lounge space has been provided on the outskirts of the track. The track itself remains clear enough for two people to converse and stroll the entire perimeter. The original intention of the client was to achieve LEED (Leadership in Energy and Environmental Design) Silver certification. As the design process evolved, however, it was decided to forgo formal certification and instead use LEED as a guide for achieving environmental sustainability within the context of the historic renovation. Some of the team’s green choices positively influence user experience: heat recovery units circulate fresh air without lowering indoor temperatures, and low-VOC (volatile organic compound) paints are less damaging to indoor air quality. The renovated gymnasium has met the expectations of the client and its many users and, in 2007, earned the Preservation Recognition Award from the Cambridge Historical Commission. The team was able to seamlessly join accessibility, sustainability, and preservation, while giving the building the contemporary infrastructure it required in order to work for everyone. While some may view the main entrance as a missed opportunity in terms of equal use, the ramp has been located in an active area and running to the covered colonnade that links the gymnasium building to Agassiz Theater. The design team worked to improve the gymnasium’s acoustic quality, challenging in a space intended for so different a use. One solution to the problem was the insertion of doors between hallways and in between almost all spaces. While this strategy effectively blocks out extramural noise, it may additionally prove disorienting, especially for users unfamiliar with the space. Furthermore, for those operating a wheelchair or walker, the doors may act as physical barriers. While the building effectively serves the clients needs programmatically, it is likely that first time users may find the first floor difficult to navigate. With two separate entrances and no clear reception area, the user must interpret the space independently in order to discover where to go and how to get there. Accessibility blends seamlessly with the style of the building as a whole such as the interior elevator and the new terrace and ramp. The building is constantly supplied with fresh air, even in winter months, ensuring good indoor air quality. By compartmentalizing the interior, noise can be controlled. This also provides spaces that afford a level of privacy for conversation, including cell phone calls, without disturbing the activity in other rooms. Re-Use of the exterior shell including window restoration and re-use of major components of the historic interior. Materials present in the building before the renovation were reused, including the marble from the old swimming pool which had been quarried in New England and is now part of the terrazzo flooring, signage and exterior terrace paving. A construction waste management system allowed 92% of materials to be recycled. Construction waste would otherwise be sent to a landfill. The inclusion of dual-flush toilets, waterless urinals, and faucets with motion sensors has reduced domestic water use by over 40%. Over half the building’s storm water is saved from the municipal sewer by use of new drywells (a system that transports rainwater into the ground). Indoor air quality benefits from the use of low-VOC (volatile organic compound) paints and the heat recovery unit, which circulates fresh air while recovering heat from exhausted air. The implementation of two 1,500 ground-water source heat pumps and geothermal wells allow the building to use less energy for its heating, ventilation, and air conditioning system.